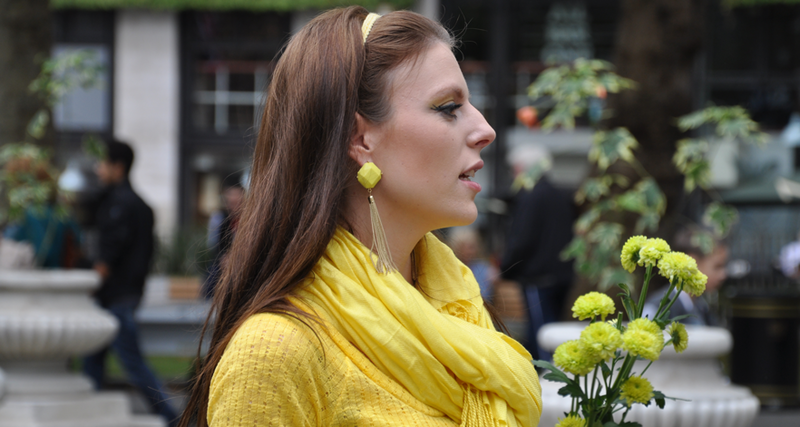 A Flash of Yellow was a Flash Mob which took place in 3 locations in the city of London in the UK on 1st September 2012 to raise awareness of Endometriosis. My name is Kaye. I was diagnosed with endometriosis years 5 ago following 15 years of trying to find help in managing my cycle. I had been “fobbed off” by a variety of doctors and medical staff. Remarks such as “It’s normal”; “All lady’s have it” and my particular favourite…”It will be better once you have had a baby” were received along with countless trials of analgesics, and anti-spasmodics. As a young woman it was almost an embarrassment to admit how awful the symptoms were and I went to extreme lengths to disguise it from new friends I was making at further education and then university. It affected me socially and emotionally. In September 2007, extremely debilitated from the constant pain, I could no longer work and my GP finally sent me back to a Gynae. After a full history and an examination I was booked for both a Laparoscopy and Hysteroscopy. 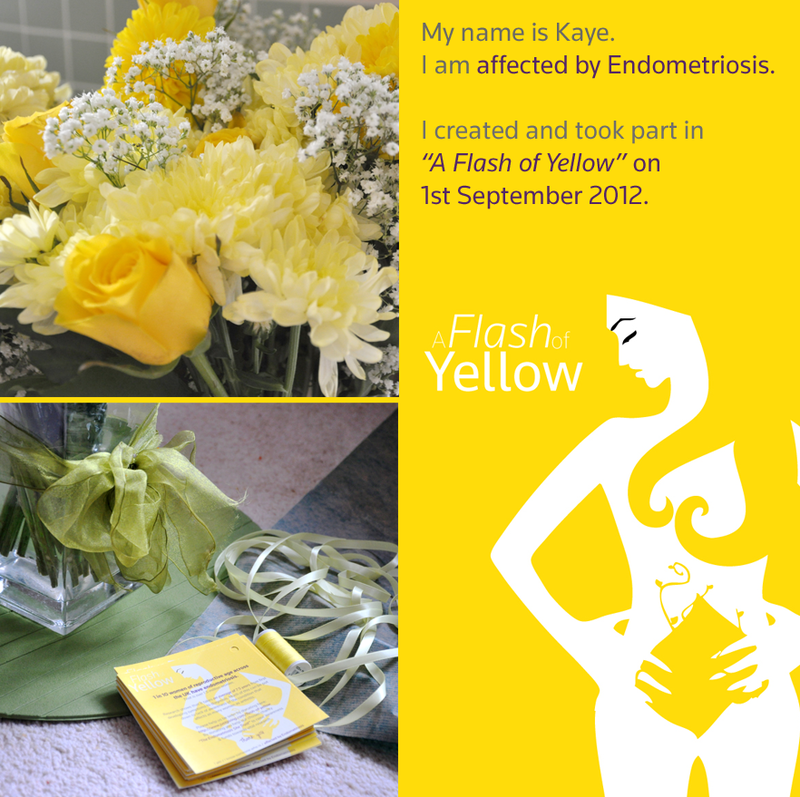 At no time was any suggestion made that endometriosis might be a cause. It was shocking to be still groggy from anaesthetic and to hear the Doctor asking if I have a partner or children and looking sad when I said “No”. He then said it was “A case of sooner rather than later…” It dawned on me he was referring to my fertility and I suddenly felt numb. This was serious. It was explained that after two and half hours of surgery, two very badly damaged ovaries, a D&C and extensive laser surgery, it was Stage 4 Endo. The Mirena coil was my best cause of treatment and was given my 5 year window for a child. How ironic that the very process that Drs had recommended would relieve my symptoms, was now the one thing that may never be available to me. Post surgery I had so many questions and I was left feeling angry, sad and lonely. After years of being told “It was nothing” I honestly expected them to find nothing. However, now there was a reason for my pain, it was not in my head nor was I feeble. But what was this Endometriosis? AND; Why hadn’t I heard of it before? Why make Flash of Yellow? On my journey to try and rebuild my life, change my attitude toward living with chronic pain, I found a strength that I did not know I had. I also discovered other strong, brave and amazing women, living in the same state as me. Whose journeys had or where going the same way as mine. 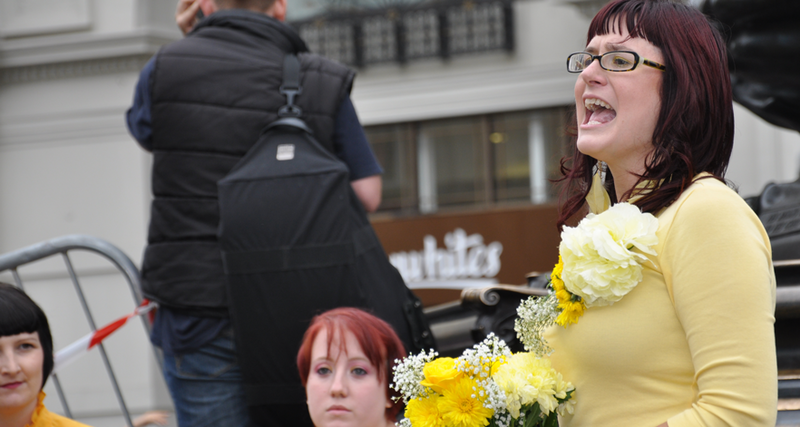 Whose anger at feeling like they where unseen and unheard and had been left to just get on and live in pain was the same as mine; people like Danielle Rachael Bevan-Jones (above) and Becca Wilcox (below). I knew I had to do something. We knew we had to do something. 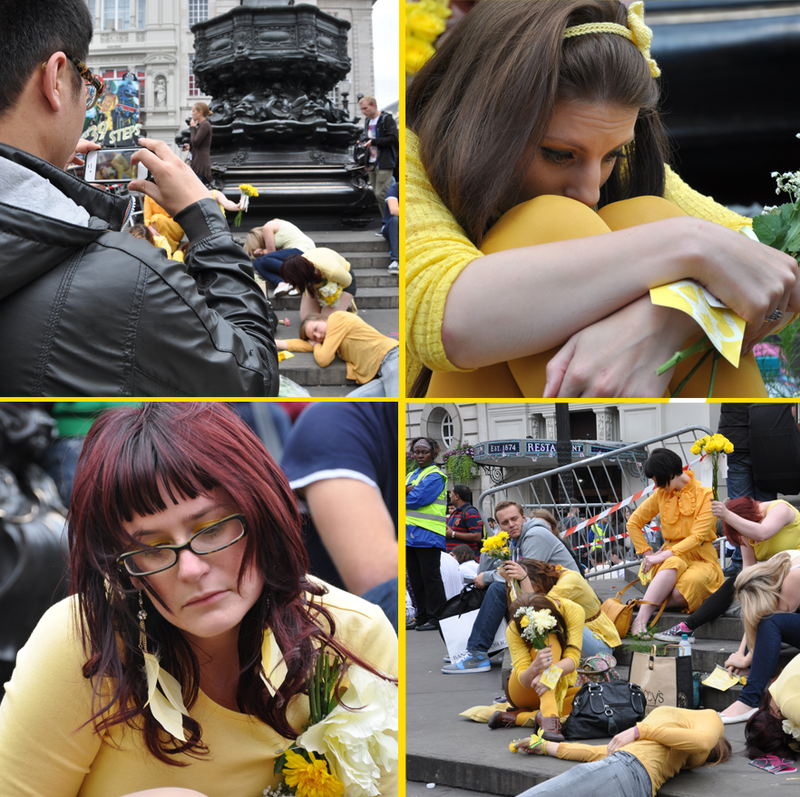 After talking to a fellow sufferer Becca, I decided to create a flash mob, with everyone dressed in yellow, the colour given to the condition but also because of the “yellow body”. You’ve probably never heard of the corpus luteum (“yellow body” in Latin), but this tissue that’s produced—and discarded—by the ovary each month and is the unsung hero of the menstrual cycle and the first trimester of pregnancy or the devil and pain maker when it come to Endometriosis. 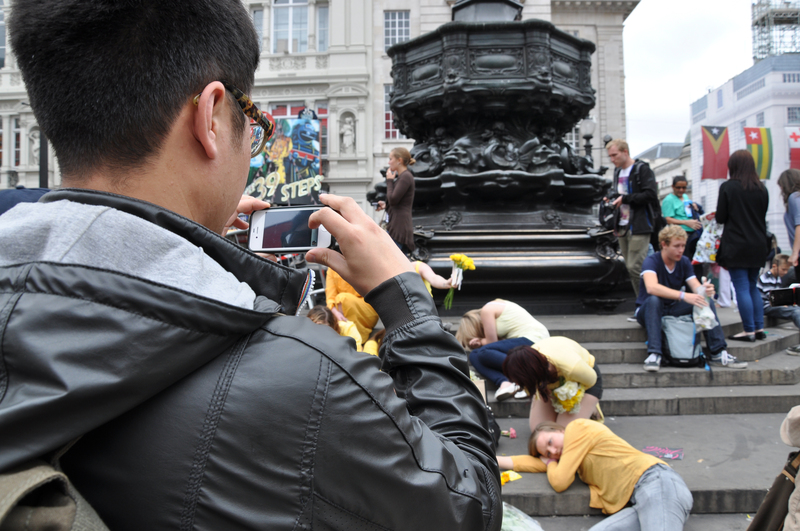 It was decided that the mob would visit 3 locations in central London on the Saturday 1st September 2012. 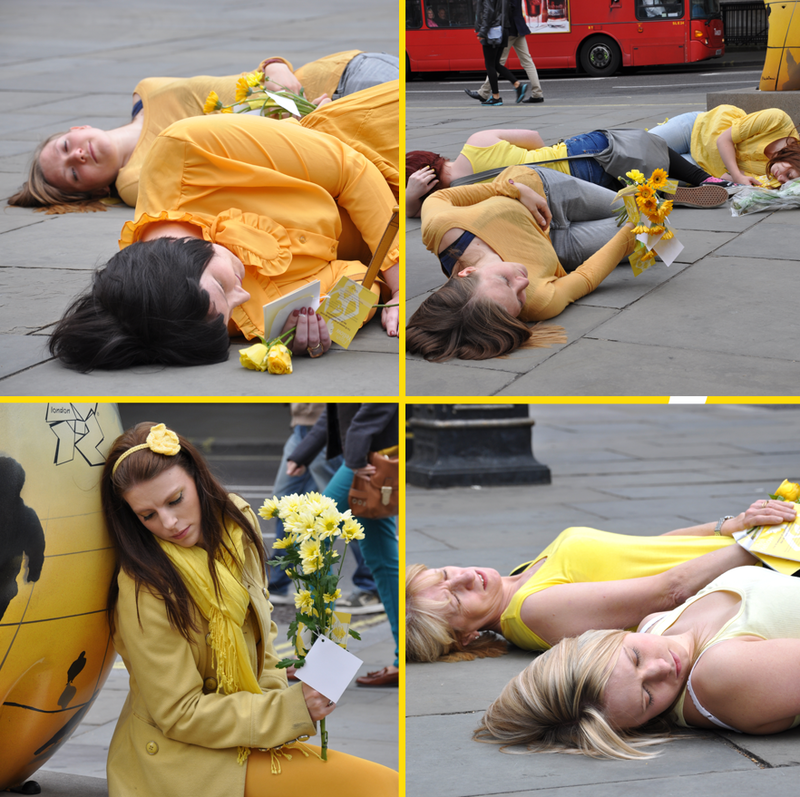 We would gather and hold a pose reflecting life with endometrisosis. The pain, the exhaustion, the fear, the loneliness and the grief. 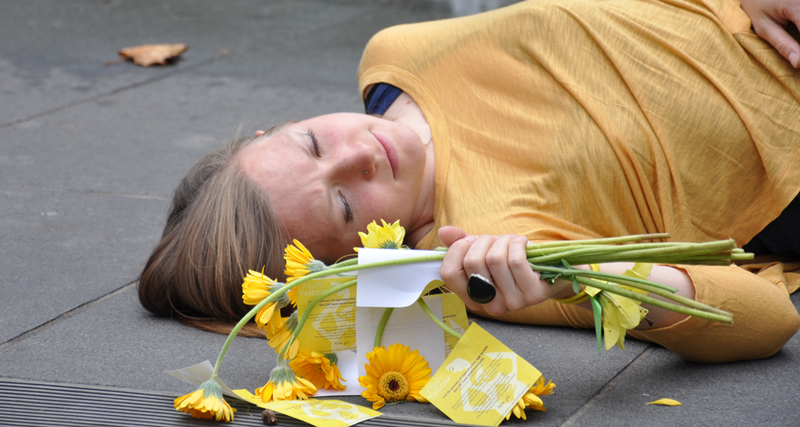 Everyone joining the flash mob printed out a label (below) and attach this to as many yellow flowers or ribbons as they wanted to give out to members of the public. A slight change due to the square being covered in Big Screens for the paralympics 2012. 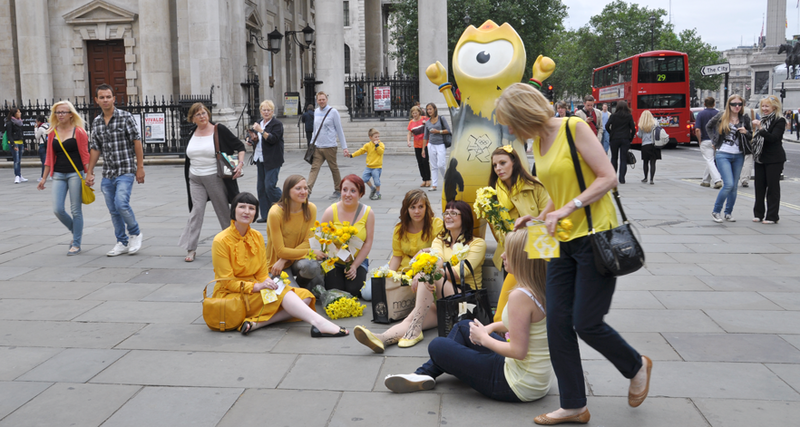 We decided not to detract from our hard working paralympic athletes, so we moved just up the road, outside the National Portrait Gallery and found a Yellow Wenlock. “LONDON! 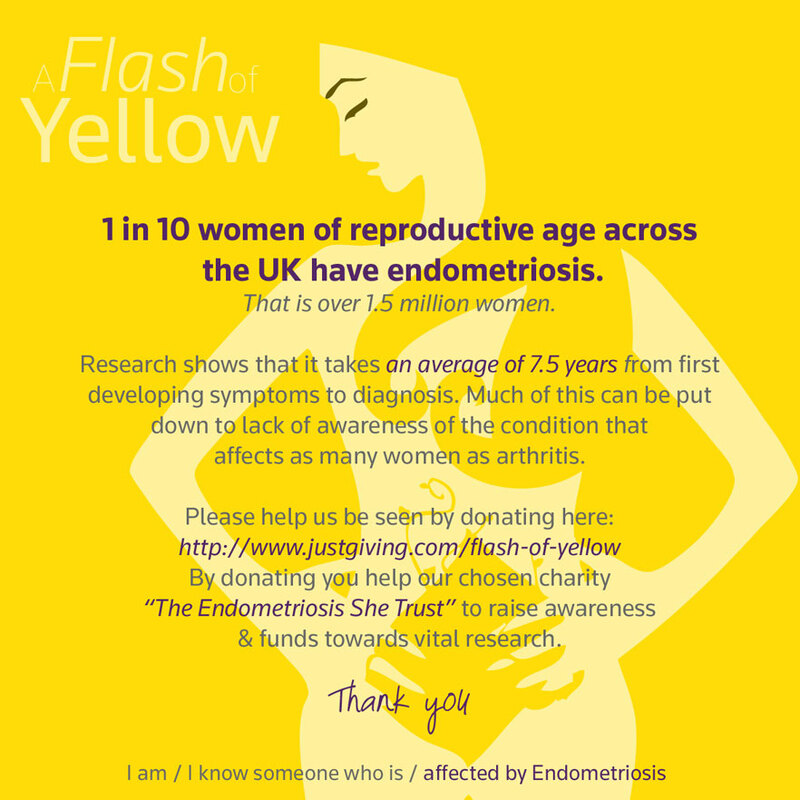 1 in 10 women of reproductive age across the UK have endometriosis. That is over 1.5 million women. 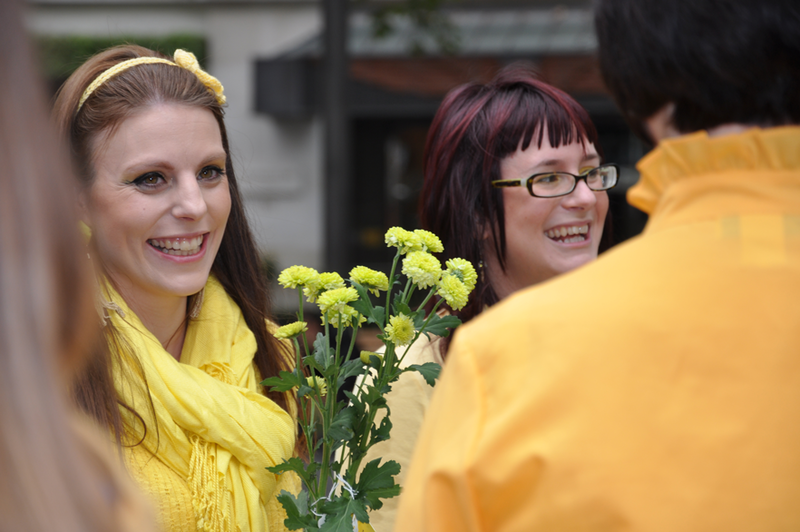 It is taking on average 7.5 years for a women in the UK to be diagnosed with Endometriosis. This is too long to live in pain. This must stop. This can be put down to lack of awareness of the condition that affects as many women as arthritis. We then took our positions and held them for 2 minutes. Lying on the floor in London is an odd feeling. I could feel the eyes, sense the confusion and the curiosity of the people going by. 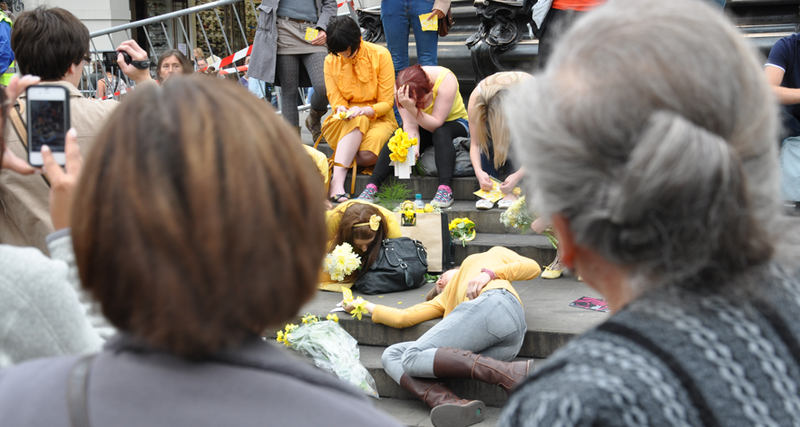 You could hear the whispers of “what are they doing?”, “what’s it for?” and people saying “it is for endometriosis” and all the questions that followed. 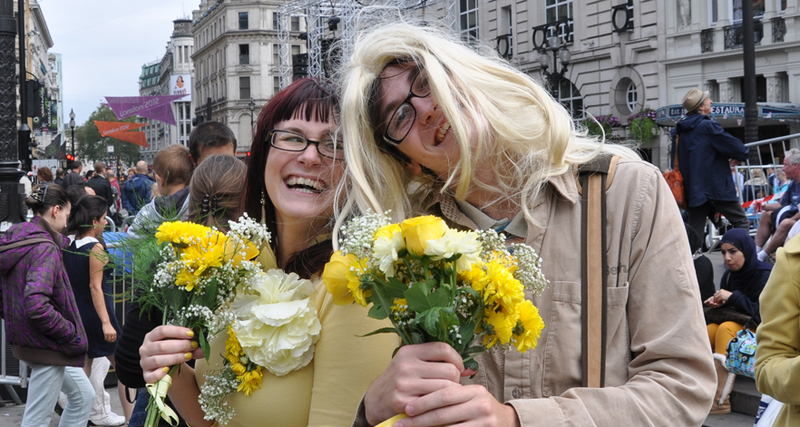 Once we finished holding our poses; We stood and gave out our flowers and/or ribbons and answered questions if asked. The response was at first a bit weary as we approached with our gifts, but they soon warmed to it which gave us all a boost, and gave us the feeling that the next one could be even better! We started to feel braver after our first try and the response it got. So we spread out a bit more at Leicester Square park. Dani spoke to the people telling her story, her journey, her struggle and after she finished, we once again we took our positions and held them for 2 minutes. This time, after we had finished holding our poses; we found people came straight up to us. Listened, asked, took the flowers without question and really read the labels and wanted to know more about the condition and how it effected us. Even the men playing ping pong in the park stopped and came and asked us about Endo. Now the BIG one. We had had two really good goes now, and we where getting into the zone! We decided that I would do my speech again, then not only where we going to hold the poses longer (3 min), but change after the 3 min and hold again AND THEN I would stand and do my speak again but this time with Dani and then repeat the holding the 2 poses all over again! I wish I could remember exactly what I said. When I have the film which was taken I will post it on here (spring 2013) so you will be able to hear it, but all I know was I was scared out of my mind, but at the same time sad and angry and I wanted people not just to hear me but to listen. And they did. I remember the faces turning to me and a few looked shocked at the truth I was shouting out. I remember saying “Fight like Girl” “There is no cure” “15 years of pain” and much more I am sure. What can I say that the impact was great! Comments, questions, pictures being taken, filming on mobile phones, and even hearing someone say it was a powerful piece of “avant garde theatre” (I am waiting for my Laurence Olivier award). Again, once we had finished people came up to us, took the flowers and asked questions and wished us well. We felt this space had the best response and crowd was fantastic here and where all feeling incredibly high from the experience but also sad it was now over. I am not embarrassed to say I broke down after the last pose. I hurt, I felt sad and I was angry and tired all at the same time. I wondered if I had done any good at all. If anyone would go away and remember us. 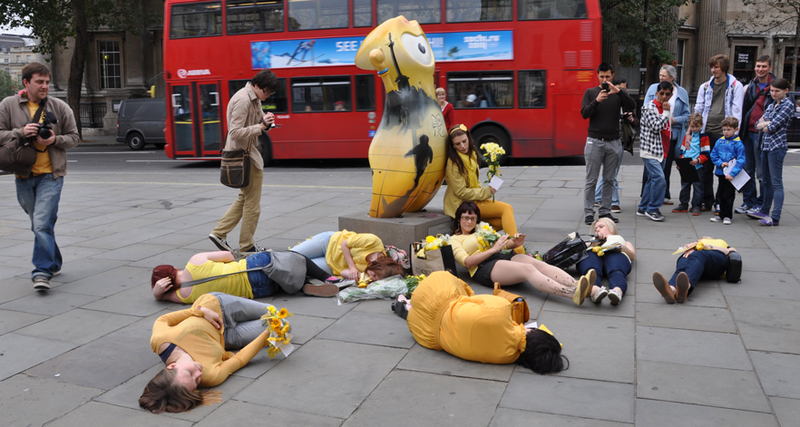 If this flash mob had worked with so few of us. It was also here we really felt that we noticed that our numbers where so few. 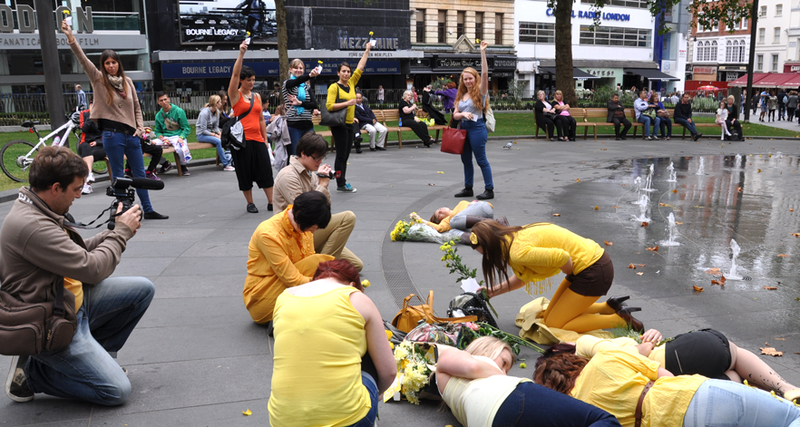 What more of an impact we could have made if the fountain had been covered in yellow bodies. When the group started I had 115 women interested, this dropped down to 20 on the last week before the mob took place and on the day only 7 group members came. A few friends, a wonderful mum, a great brother and one partner came to support us 7. A huge thank you to them. In a fit of madness, adrenaline, tears, pain as well as relief, I agreed along with those 7 girls, that WE WILL BE DOING THIS AGAIN! BUT we will need more women. COME ON GIRLS, LADIES of the UK! There are 1.5 million of you out there! Even if people do not want to pose, we need more people to just give out the flowers and labels or explain why we are there. So, Watch this space. Share this story. But it was not all serious, we had fun too! 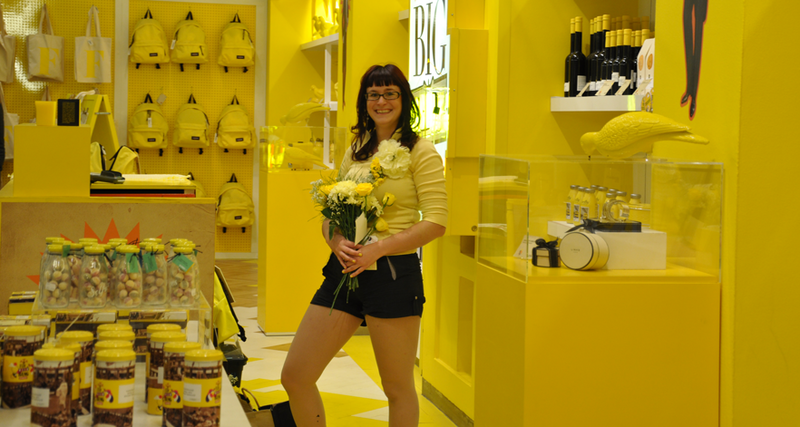 Even the best department store in the world, Selfridges let me play in the yellow shop! The effects of the disease on a woman’s life can be serious and far reaching. Many have had to give up their jobs and restrict their lifestyle and experience difficulty coping with families. Often no real account is taken of their feelings when they are treated for a disease so closely linked with their emotions. Many people disbelieve the level of pain. This can drag you down mentally and physically as your body tries to cope with the pain. When I first posted this on another blog, it was two day’s later and I was exhausted, emotional and I hurt all over. But it was totally worth it. For those few women that came, thank you from the bottom, top and middle of my heart. What an amazing day. Even thou we were few, we gave London something to talk about on that Saturday. Please help me and other women by sharing this blog post.